Many of our churches are clean inside, but the street outside becomes a dumping ground. And when we do get the municipality to take away the rubbish, within a few days it is dirty again. Why not turn that dumping site into a garden, so that people wont dump again. 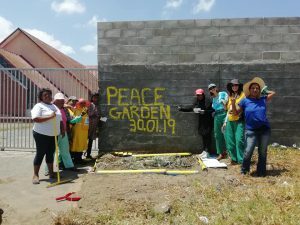 The Church of the Resurrecfion in Bonteheuwel, with the Bonteheuwel Walking ladies group, the IWPG Peace Committee, Communitree and CTEET got together to transform the street outside the church. The garden will be known as the David Profit Street Fynbos Peace Garden. to remove the rubble for us please. You are most welcome to visit David Profit Street Fynbos Peace Garden. Planning to have benches in surrounding Fynbos Garden for people to relax, but more so, to learn about the thousands of species of Fynbos which only grows in The Western Cape. This will be the first Fynbos Garden in Bonteheuwel and we will surely expand the project. We need to take pride in the spaces we live in. The environment also have rights, so let us respect it. Yours in Peace and Harmony. Which of the Favours of our CREATOR can we ever deny?